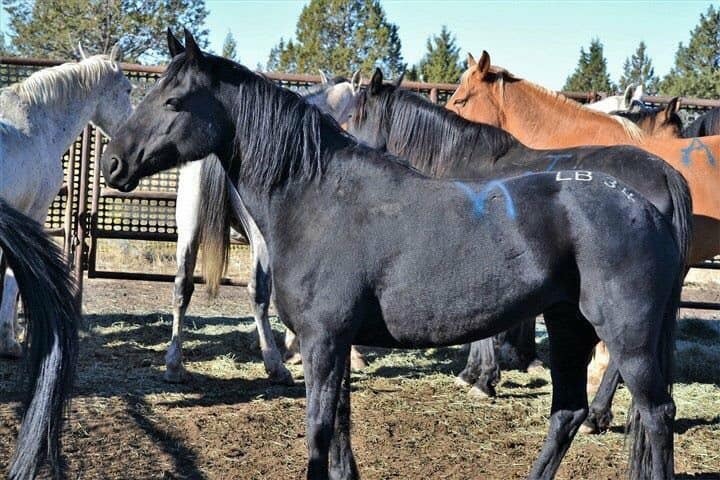 When wild horses are gathered by the BLM and processed, they are given a unique brand on the left side of their neck. This brand utilizes the Alpha Angle system developed by Dr. Keith Farrell of Washington State University. We have an article dedicated to this system that you can view here: Alpha Angle Branding System. This post is quite lengthy so here are the sections in case you want to skip ahead. The easiest way to “read” a BLM brand is to try and copy the symbols down on a piece of paper and then decrypt them. 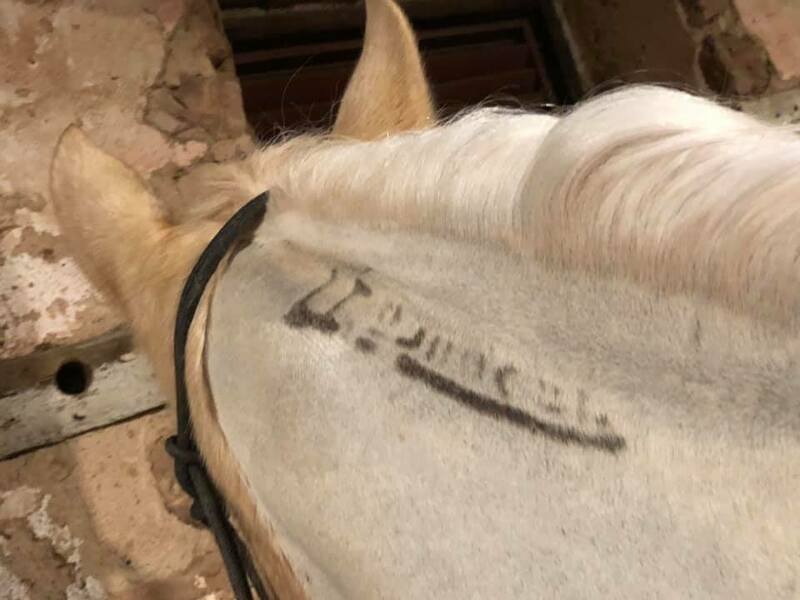 On most horses the brand comes out pretty clear. Especially so on darker horses like black, brown, sorrel etc. On a lighter colored horse, the brand can be more difficult to see. 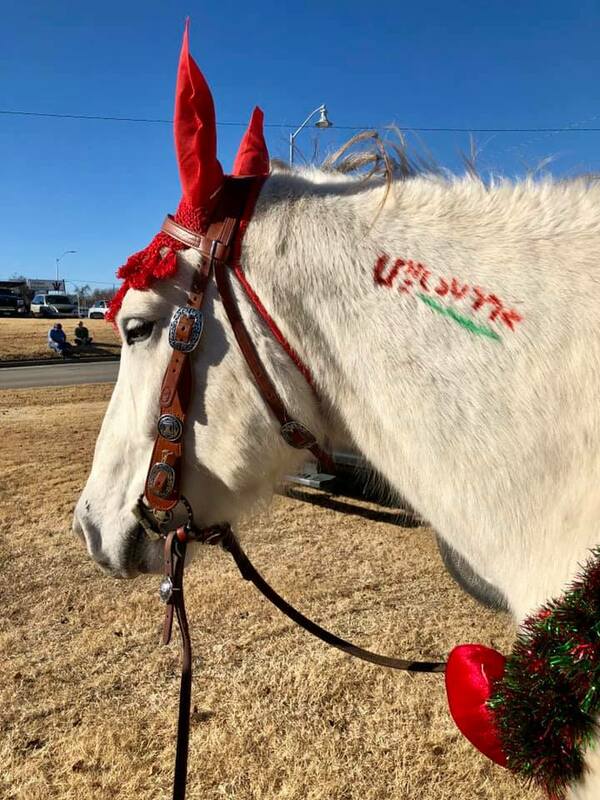 There are two different ways that a light colored horse might be branded. 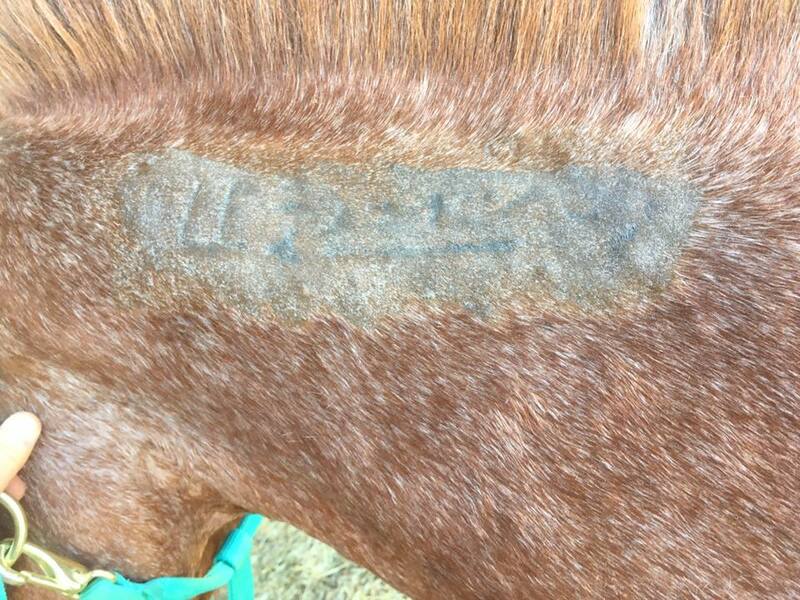 If the BLM knows the horse is going to go gray or is a pale color, they can hold the branding iron on the neck longer. Instead of turning white, the hair just doesn’t grow back leaving the skin color underneath showing. That is really evident on this Palominos brand. Saxon is from the HMA and his brand was held a little longer than it would have been on a bay or sorrel mustang. This makes his brand easier to read against his light coat. 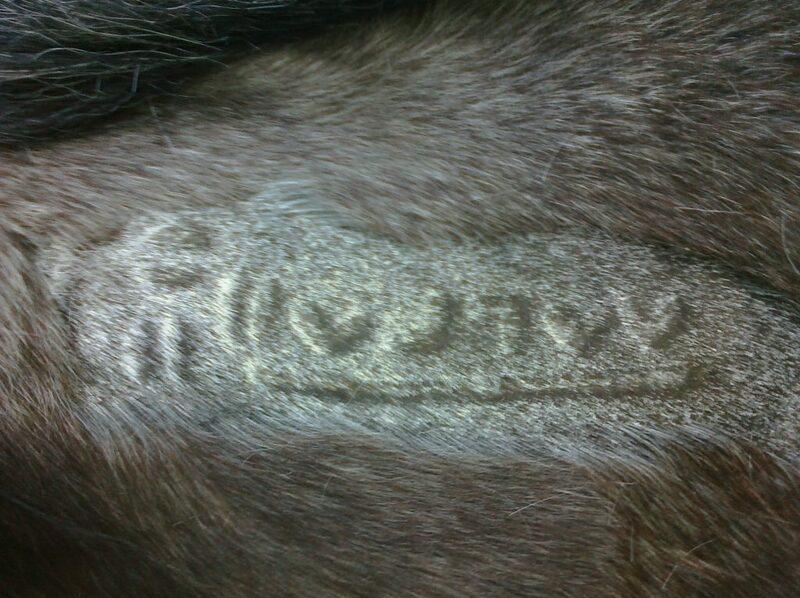 On a gray horse, if the branding iron is not held long enough, the hair will grow back white and not be as visible. 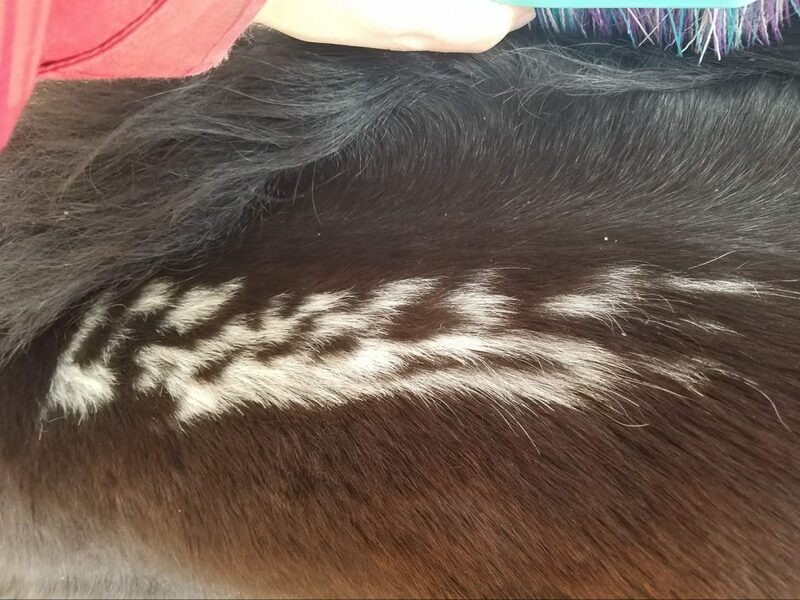 This would more commonly happen when a horse is branded at a young age and then later turns gray. 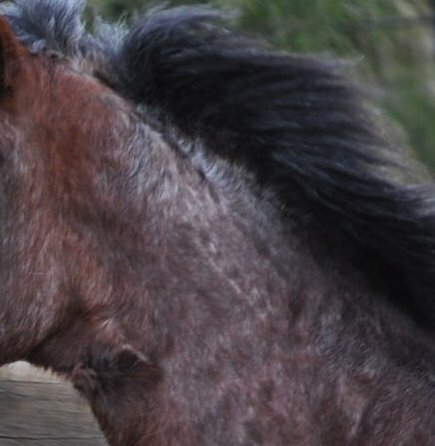 Take a look at this horse. He’s a nice, dark gray now but he will get lighter and lighter as he ages, eventually he should be all white. As he ages, his brand will become less and less visible until it can’t be seen at all. 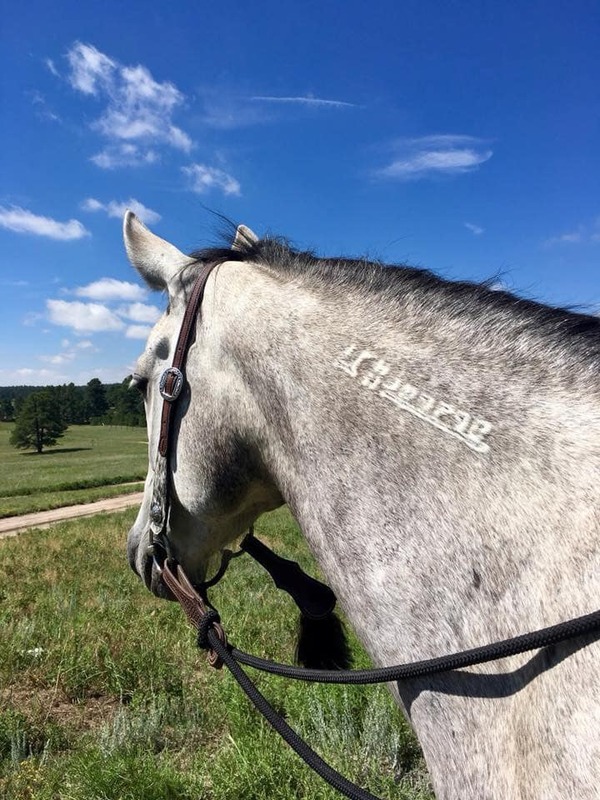 Sometimes a horse moves or jumps around in the branding chute and the contact isn’t held long enough for a clear brand to be made. In these cases, some or all of the letters may be illegible. These are a couple of good examples of that. Even shaved, these brands are not legible. 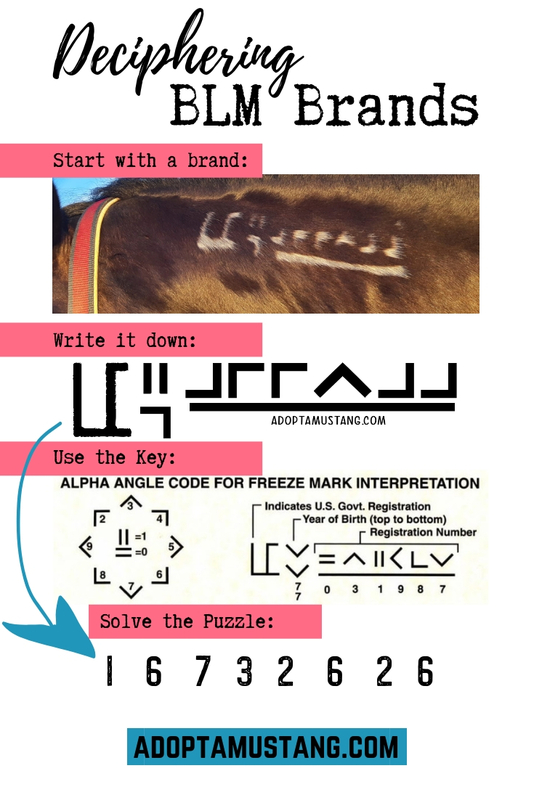 If you are having trouble reading your horse or burros BLM brand there are a few steps you can take to help it become legible. Typically, shaving the brand helps the most. 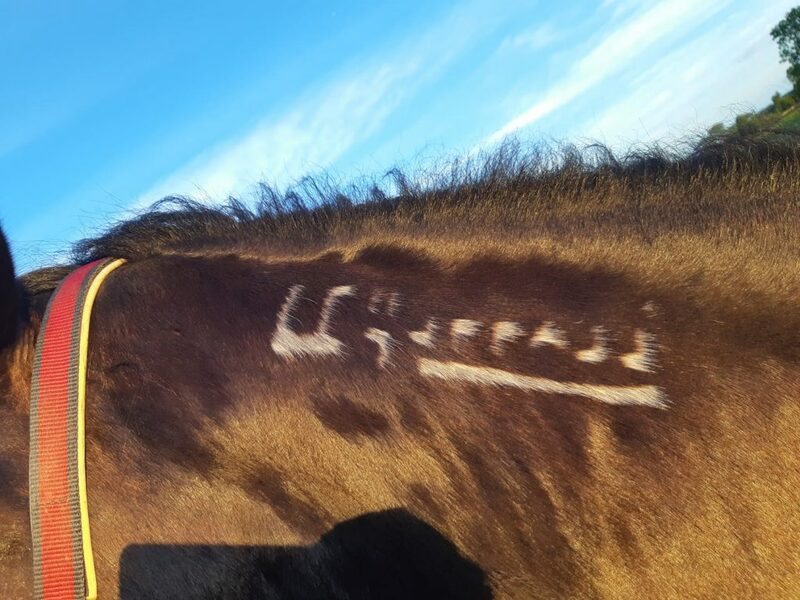 Here is an example of a brand on a bay roan BLM mare. When we bought her, we didn’t know she was a mustang but something about her color seemed off. 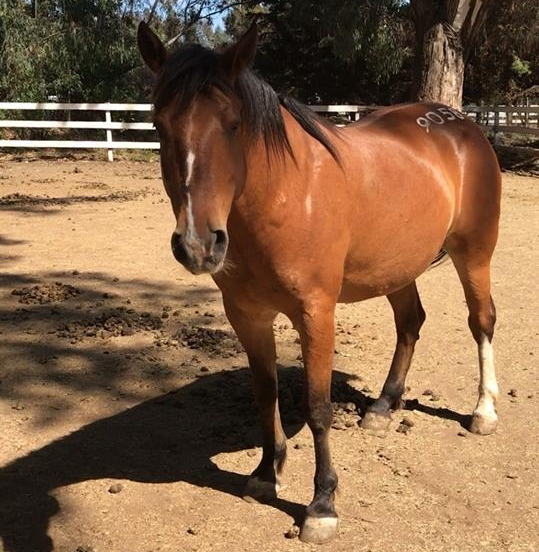 We sent the picture off to BLM to see what they thought and they confirmed the thought she was a mustang. They said to shave the brand to make it more clear. Interestingly, her brand raised up when we shaved it. 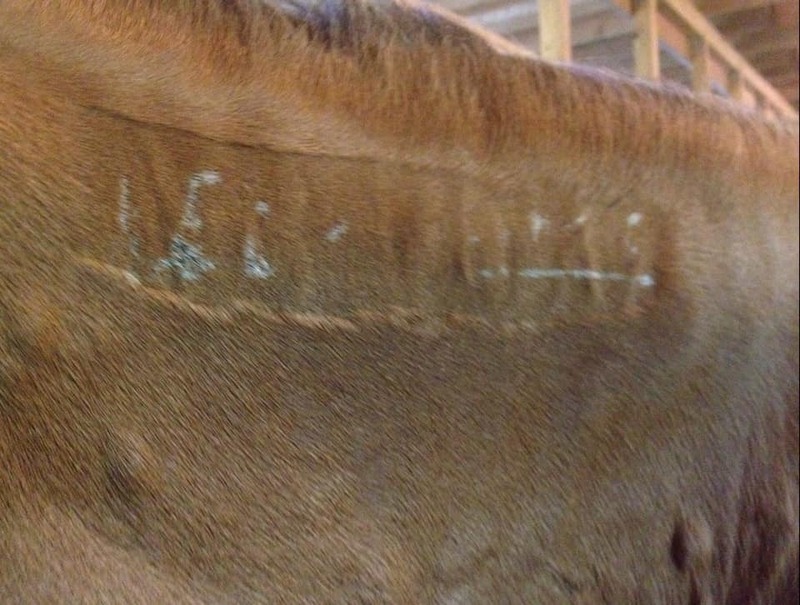 This is the only horse I’ve ever seen this happen to but luckily it did allow us to see her brand! 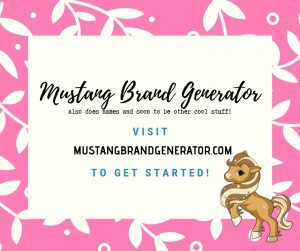 Here is what it looks like when I run the number through the mustang brand generator. 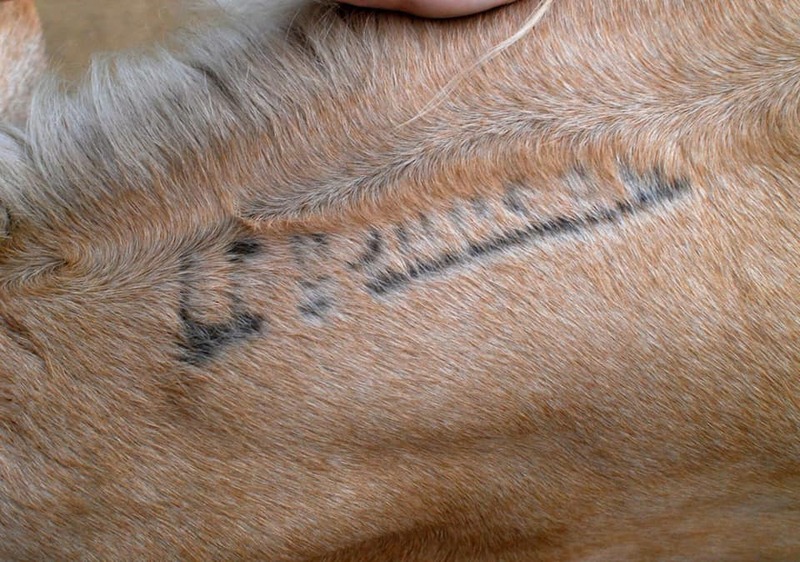 The brand on the palomino BLM mustang above shows a brand that was held longer so that no hair would grow back. 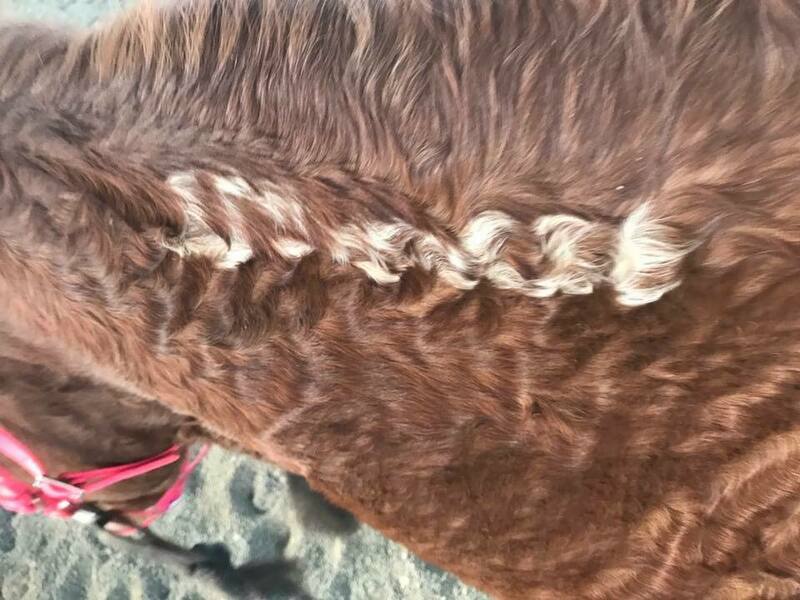 This mare is in her summer coat but there is still enough hair to make the details of the brand characters hard to read. Here is the same horse (in winter) but with the brand shaved. You can see how shaving has made the characters more easy to read. Here is a before and after of a BLM Brand on a Curly Mustang. The difference between the two is a winter coat vs. a summer coat. You can definitely see how shaving during winter would have helped the characters become more legible. The summer coat brand is legible but would be much more clear if it were shaved. 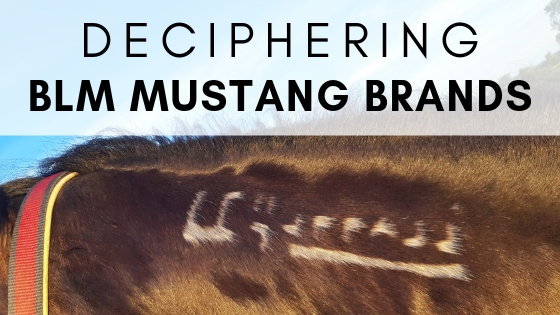 There is, however, no need to regularly shave your mustangs brand if you already know what it reads. Some people will make sure it stays legible as a form of “mustang pride”. 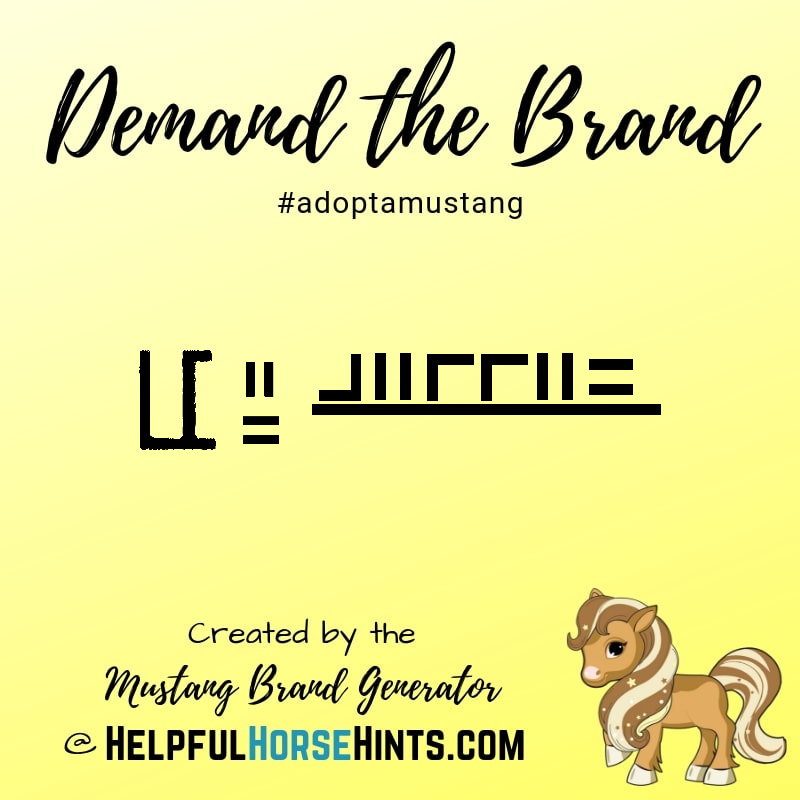 The brand can definitely be a conversation starter for those who are unaware that you can adopt a mustang or who are misinformed and believe mustangs are wild, crazy animals that can’t truly be tamed. Here is what the brand reads. 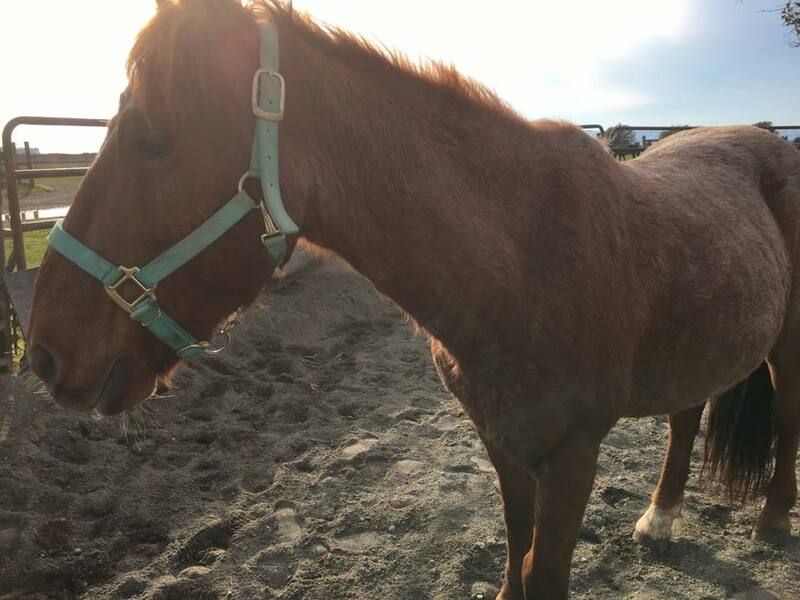 After a horse has been offered for adoption three times, BLM can make them “Sale Authority”. 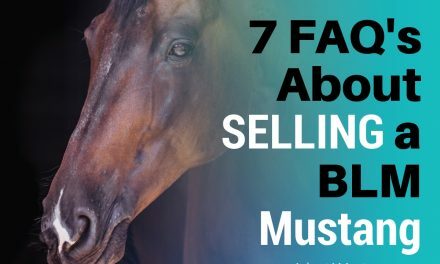 This means that the horses can be offered for purchase instead of adoption. An application must still be filled out and approved. BLM also limits the number of sale authority animals an individual can purchase in an attempt to assure good homes. 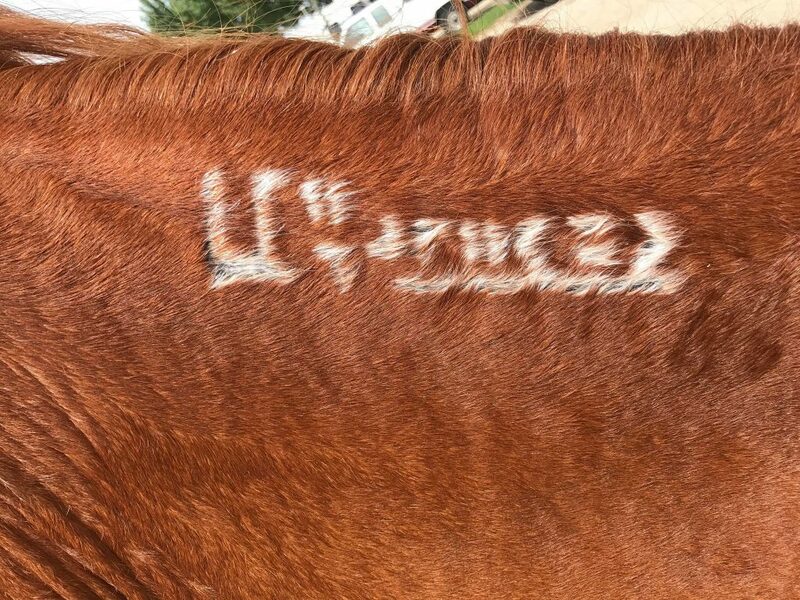 When a horse is determined to be sale authority, a big U is added at the end of their brand. This big U is the easiest way to signify that a horse is sale authority. 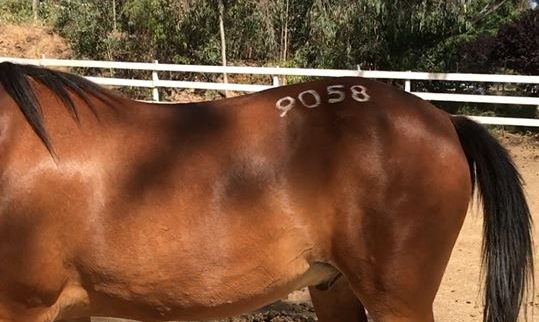 If still at the corral, this animal is available for purchase and, if you see one out on trail or at a show, it just means the horse is already titled because title passed at time of purchase. Here are a couple examples of sale authority brands. 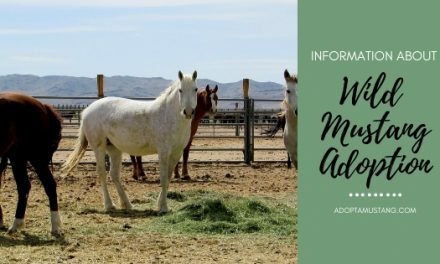 Horses that are not adopted or sold are sometimes sent to larger holding facilities by BLM. These facilities are often comprised of extremely large pastures where the mustangs roam together. To make identification easier at these very large facilities, BLM will prep a horse by branding the horse’s hip with the last four digits of its brand number. This makes the horse easily identifiable from very far away. Horses are typically hip branded at the adoption facility and are still available for adoption until they ship out. That means, it is possible for horses that have a hip brand to be adopted. Here is what a hip brand on a mustang looks like. Keep in mind, the horse still has his regular neck brand as well. This is just an extra brand because he had been prepped to go to long term holding. Some hip brands may have letters and numbers. 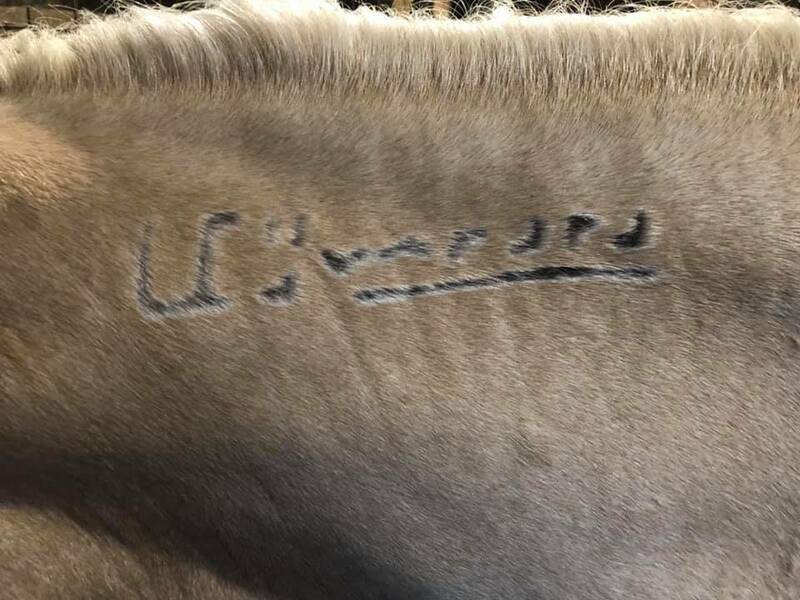 If you see a hip brand like this the horse *should* be a mare and the hip brand means she was treated with fertility control and released back out on the range at some point. That is the case with this Devil’s Garden mare. 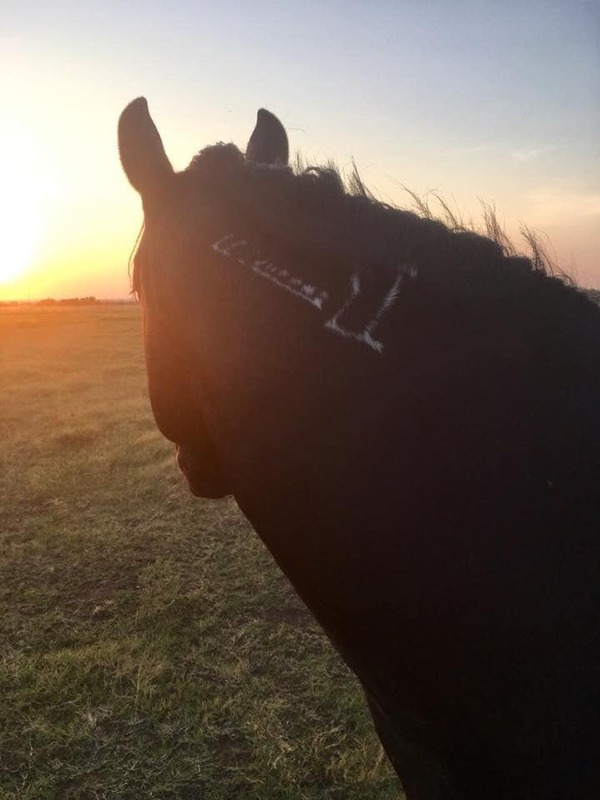 She has both a BLM brand on her neck and a brand reading “LB 34” on her hip indicating she was treated with fertility control at some point. 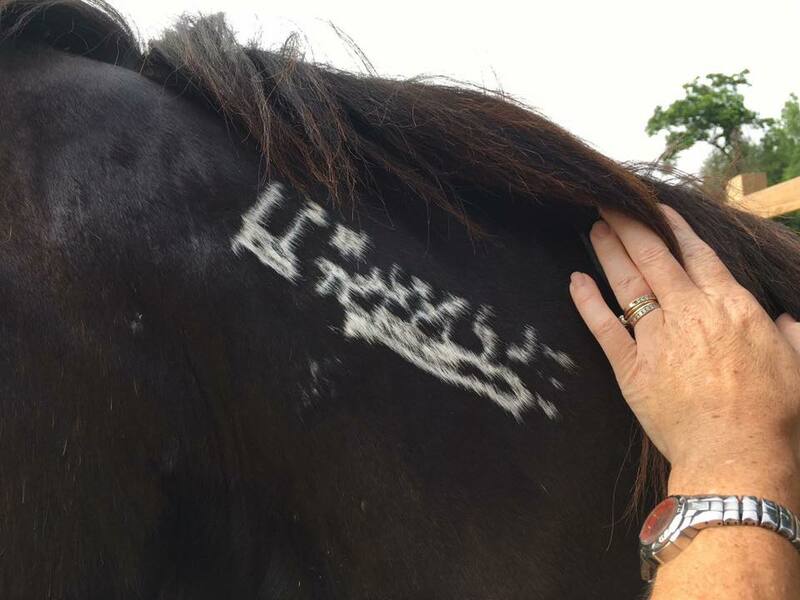 The horse was branded with the incorrect number so a second brand is added with the correct number. The horse moved our jumped during the branding process. On this BLM mustang the brand wasn’t doubled but we can see a line above the symbols. This is probably the result of the brand being held more firmly and the top part of the branding iron came into contact with the skin. 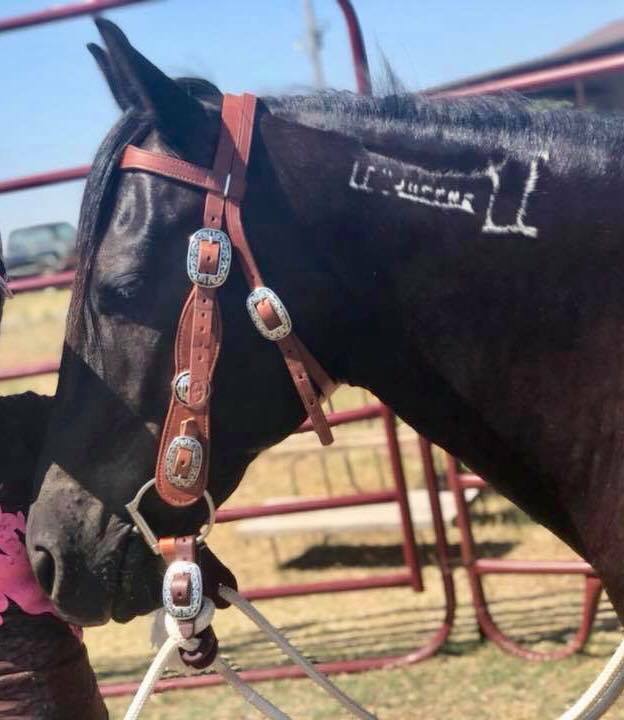 BLM Mustang owners love to show off their horses brands! There are so many different ways to draw attention to it. Here are some BLM mustangs proudly sporting their brands! 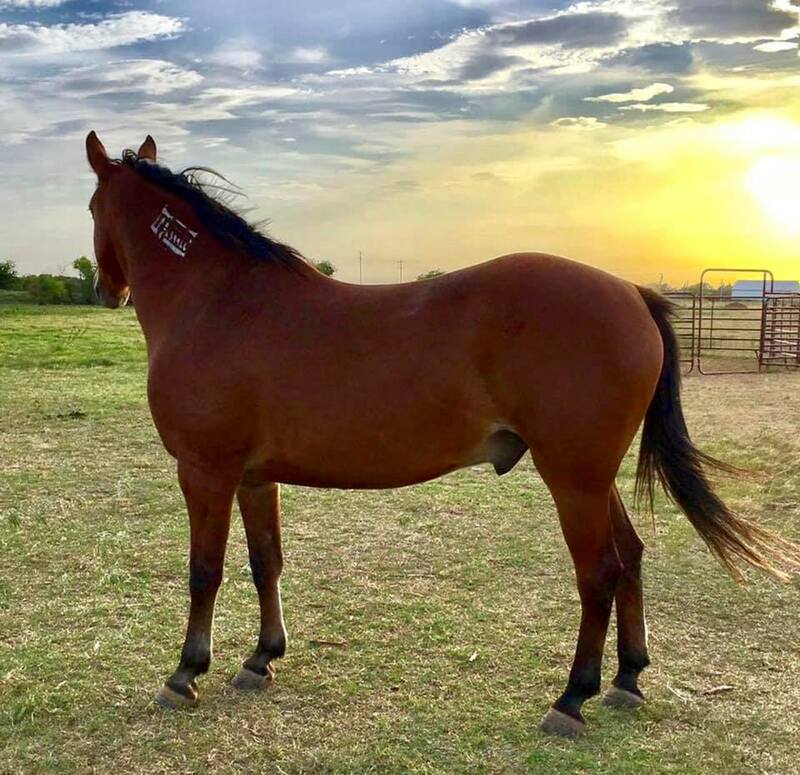 “Moonshine” is a 2010 gelding from Adobe Town HMA owned by S. Crider. All of the awesome brand graphics in this article were generated with the BLM Brand Generator. 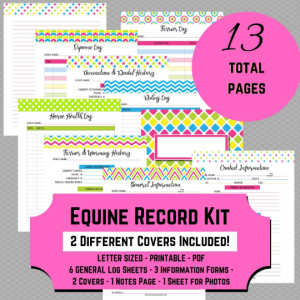 With this free online tool, you simply enter your horses year of birth and the last six digits of their brand number and it will create a sharable version of the BLM brand for you. 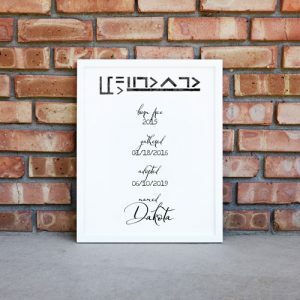 You can also use this image to proudly have your brand printed on various items. Do you have examples of BLM brands like the ones we’ve shown here? We would love to get an individual gallery going for each section but we need contributors to be able to do that! If you have a photo you would like to submit email lairicllc at gmail.com. Please give as much information as possible (name, brand number, hma, etc). We will always credit photos to the original submitter unless you specifically request to remain anonymous!